I never really understood the appeal of Roses in Winter (a now retired multi-step stamping floral set), but now that I have this multi-step set, I get it. It's almost a different kind of stamping. You need to plan your colours from the base up and it's fun to experiment with what colours work out best. 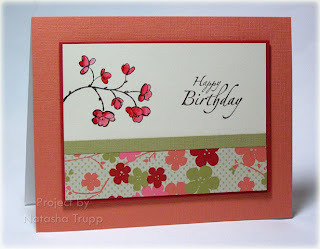 My first card features pinks and reds. I started with a stamped of Rose Red, then Rose Red, Cranberry Crisp, and finally Bravo Burgundy. I went with the celery, wasabi, and garden greens for the leaves once again. 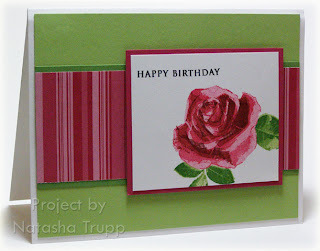 I decided to just keep the main image to one rose, stamped a simple greeting, paired it with the Rose Red striped paper and some of the greens, and that was it! 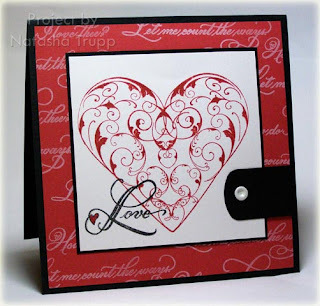 Stamps: 3-Step Roses & Hearts, Borders & Corners Monogram ed. 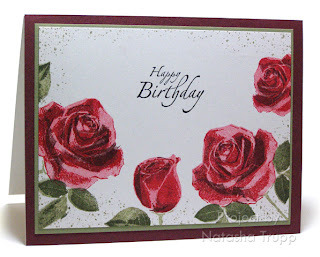 For my second card, I went with just red roses. I remember seeing a number of the clustered corners layouts with the multi-step flower sets. I decided to take a stab at my own version. I started with Real Red, stamped off once, then Real Red, Bravo Burgundy stamped off, and finally Bravo Burgundy. I wanted a different look to the leaves, so I went with Mellow Moss and Always Artichoke. 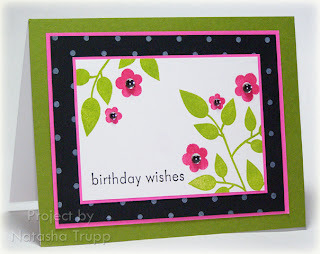 I added a greeting in black, then stamped in some Moss splatters all around the edges. I was feeling a lack of inspiration this morning, so I decided to browse some of my favorite blogs. This card by Valerie inspired me. I've certainly used this layout before, but sometimes you need that little spark to create something. I got out Eat Cake and some matching paper and whipped together this card. There are little bits of glitter on the candle flames. *this card measures 7-1/4 x3-3/4 and fits into a 7-3/8x3-7/8 envelope from Carlton Cards. 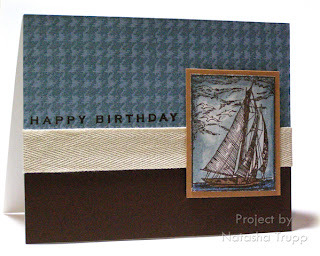 This card started out because I really was in the mood to use some Cool Caribbean paper. 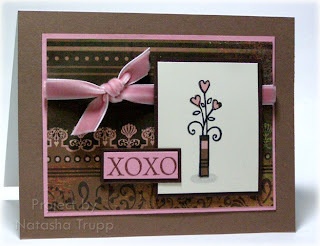 I stamped the Harlequin background and used the row of flower accessories. I didn't want to cover too much of that background, so I went with a pretty basic layout. Some lovely flowers coloured in with a few Copics then outlined with a sparkly blue gel pen, and a scripted birthday greeting. I also outlined the flowers with a 10% grey marker. LOVE that effect! Here's another birthday card. I started with 2 Colorbox inks, and it kind of just came together from there. I always like the look of flowers bursting onto the white with an off-center greeting. I brought in a layer of black, since I had stamped the greeting in black. It seemed a little dull, so I added white polka dots to the black. It was still lacking, and finally I saw that my Garden Party gelly gems would go perfectly with the flowers. 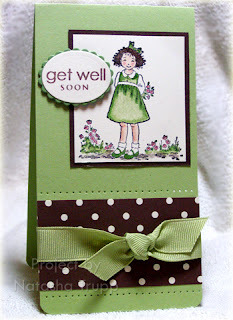 Stamps: Beautiful Blooms, Green Thumb by PaperTrey Ink, Card Greetings I by Green Grass Stamps, Polka Dot BG by Stampin' Up! It's funny, I've been seeing this set, Good Things Grow, on a lot of people's retirement sales list lately. I actually only got this set a few days before it retired. It was one of those sets that always caught my eye, but I never bothered to pick up. Now, I don't know if I'll ever get rid of it. It makes such sharp-looking quick cards. Because of the bold square image, I thought some spectrum stamping would look nice. I am still on my birthday card kick, so I went with the dandelion stamp, thinking about wishing. I inked it up with a Brilliance pigment inkpad- Peacock, and loved the results. I used the stamp-a-ma-jig to line 3 up in a line. Next, I paired it with some pastel Bazzill Bling paper. I really like the simple layout with all the subtle shimmer. I also have the Twilight Brilliance inkpad, so I went ahead and did a pink and purple version too. Again, I paired it with some pastel Bazzill Bling paper. 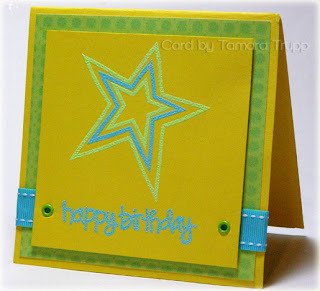 I stamped a PaperTrey Ink greeting on there and left a slight white border on the cardbase. I'm really happy with how these ones turned out! When you're not feeling ultra creative, these little 3x3 notes work out really well. I sketched out a few layouts that work on such a small scale, and thought that the crowns from the Mardi Gras would look great in this layout. I chose some Basic Grey papers first and matched my colours from there. For the first one, I used the new Two Scoops 6x6 pad, drawing out Regal Rose and Barely Banana. I also added a little bit of stickles to the crown. For the second card, I used some paper from the Mellow 6x6 pad. I drew out the Cranberry Crisp from it. I thought about doing Mellow Moss as well, but I wanted to show more of the background since it wasn't as repetitive as the Two Scoops one. 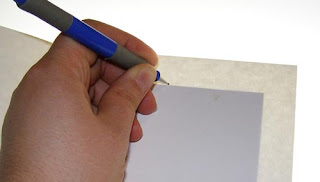 Generally doing these small note cards is a great "warm-up" activity. Or if you're not feeling too creative, it's a little something that can be useful in the future. You never know when you want to add on a little note to a hostess gift, flowers, or something like that. You can never get tired of birthday cards, right?? And if you can, there's no reason these cards couldn't be used for several other purposes- congratulations, thank you, best wishes are a few other sentiments that would fit nicely into these ones. I made these two last night. I didn't feel like making 2 of the exact same card. Instead, I picked my colour scheme (note to self, when deciding on mellow moss in said colour scheme, be sure to NOT grab the sage shadow marker...) and went from there. I also used the same types of embellishments and tools (moss polka dot ribbon, paper piercing, the button was an afterthought on the 2nd card). Even though I used a retired stamp set on here, you could easily replace the main flower and the sentiment from anything in your collection. 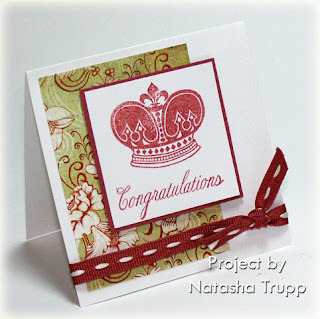 I saw a layout in the latest Stampin' Success magazine. 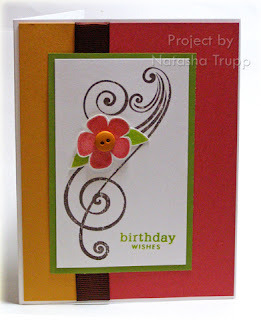 It featured a rub-on swirl, sentiment, and a cut out flower. I liked the simplistic look to it and thought, I can do that with what I already have. I started with a swirl from Spiral Symphony. 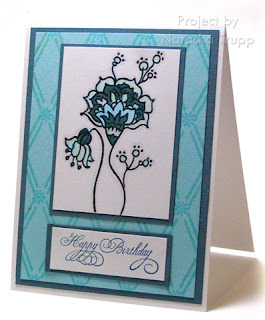 Then I stamped a flower from Bloom, some leaves from Beautiful Blooms, and cut those out. The sentiment comes from Faux Ribbon. I'm still on a simple layout kick. I just haven't been feeling the busy, several layered, several embellished cards lately. Maybe because I have been doing multiples of some items, I don't know. I decided to deviate from that one layout for my "assignment" to another go-to style I often use. I was going to make two of the same cards, but there were little things I didn't quite like with the first one. For instance, I would rather have River Rock ribbon on this one, but I do not have any. I went with a strip of river rock textured paper instead. The card works, but I just wasn't loving it. So I made little changes for the second card. Instead of using the striped side of the DP, I used the floral side. It's busier and packs way more of a visual punch. I increased the ruby red mat by about 1/8''. I stamped the branch to make it seem as though it was growing onto the paper, instead of floating. I also went with a bigger, fancier sentiment. 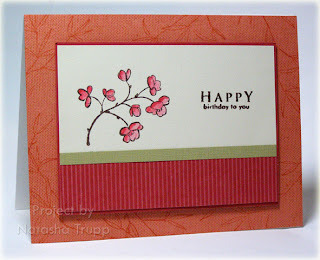 Instead of stamping the background with linen, then the bamboo, I went with textured guava paper. It's funny, they are almost the exact same card, but I really prefer the second one. Here's another quick and easy birthday card for my long list. I made two of these ones. I really wanted to use the sailboat image, and I've always liked it paired with the Houndstooth background. I still think retiring Houndstooth and Linograph after only ONE year was a HUGE mistake. They are so universal and almost timeless. Seriously, how much houndstooth am I still seeing 2 years later! Anyway, here's the card. It's funny, this is pretty much the same layout as the other 2 I made. I didn't even realize until after the fact. It's a very versatile layout that works both horizontally and vertically. I watercoloured the main image and added some twill tape for a nautical touch. How fun are these stamps from Flourishes? 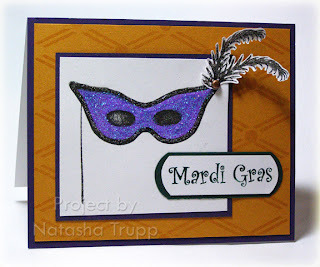 It's funny, a few years ago, my mom threw a Mardi Gras party and we couldn't find any mask stamps anywhere. I ended up designing my own mask (thankfully it was a pretty small party). But now, there are these available! The background stamp is also a new release. For this card, I brought out a ton of glitter and shimmer. 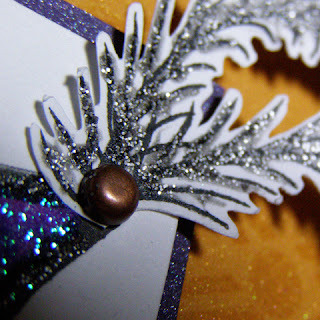 I coated the masked with glue, put on purple glitter, then outlined the mask and the feathers with gun metal Stickles. The mustard and eggplant are both sprayed with my glimmer mist concoction (pearl ex + hairspray). I made the word strip and frame using Jan's method seen here. I cut my paper to 3/4'' and used the 1'' circle punch. The card really sparkles in real life. Of course most of those details are lost with photography, but it's quite pretty. Here's a close up of the feathers. Here you can see all the stickles on the feather, as well as the shimmer on the eggplant and mustard. This is my submission for this month's challenge. Required Element: Something *SWEET* - you may interpret that any way you like. Restricted Element: NO standard A-2 cards (4.25 x 5.5). Any other card size or type of project is OK. I used the little girl from And Everything Nice for the focus image. My "sweet" element is the theme, as well as the Au Chocolate paper. And the card is 3.25x6. I coloured the main image with the SU markers. The celery streaked a bit on the dress, but I retouched it with the blender pen and it smoothed out nicely. Don't forget that you can use your blender pens this way! On the ultra smooth cardstocks they can reactivate the dye ink and be blended easily. Be sure to check out all the other submissions here. 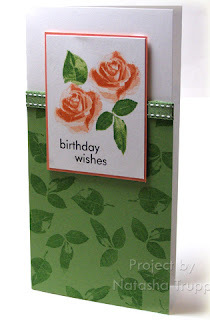 Here is another design for my growing list of birthday cards. I've decided (finally) that although I don't really like mass production, it makes a lot more sense to make at least 1 extra of each design. One card may take 20 minutes to make, but that extra card is only going to add on 5 more minutes. I'm sure I've made something like this before, but it's a tried and true design. The striped paper is retired Four Seasons, this is the autumn sheet. I started with that for my inspiration. I inked up the leaf stamp with a mustard and a burgundy marker. Then I mixed up the ink with an aquabrush. 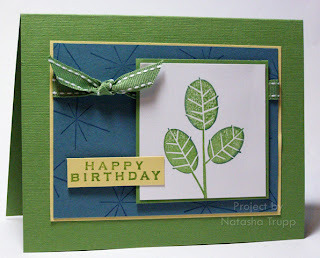 Once that was dry, I re-stamped the leaf image over top, to emphasize all the leaf details. The greeting is embossed with gold EP. I added some distressing to the main image, some burgundy ribbon, and some gold cord. Here's my first card using Embrace Life. I know I'm a bit late on the bandwagon for this set, but I was waiting until the new catalog release, just in case there was something I liked even better than this. I paired it with the coordinating papers and added in some Wasabi, and I had a birthday card. I made 2 of these, only 15 more other birthday cards to make! I stamped the flower on some patterned paper and cut it out and popped it up. 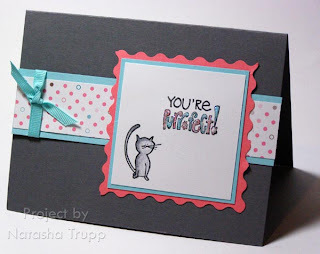 The greeting is from a PaperTrey ink set- Faux Ribbon. So, as soon as I saw this dinosaur set, I had to have it. Dinosaurs have been the theme of many inside jokes among my family and friends. It all started with me saying something completely random several years ago. Even now, it's still funny. Anyway, this is one of the new sets I received today. 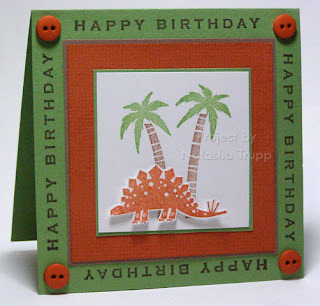 I went with a simple scene, stamping the palm trees, and cutting out the stegosaurus and popping him forward. I wanted some extra texture, and thought that Canvas would go nicely. 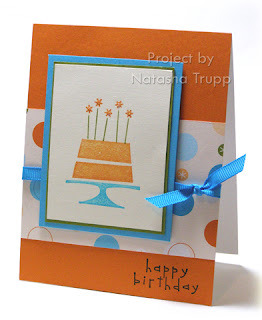 Finally, I was in the mood for a square theme, and isn't it just perfect that the Happy Birthday sentiment fits so nicely as a border on a 4.25 square card! I finished off the corners with one of my hoarded embellishments- Earth Elements buttons. I haven't been updating much these past few days, but I have been stamping a lot! It's my last month as a Dirty Dozen designer, and I've been having lots of fun with the projects! I can't wait to share them. If you're not a fan club member, check out the details here. Today, I squeezed in a challenge creation. The Sunday featured artist was Veronica. I don't think I've ever seen her gallery. It's always fun to discover a new gallery! This card was my inspiration. The challenge is to modify at least 2 items. I changed my colour scheme to earth elements. I watercoloured and masked the hearts. I also flipped the tab (that was more of an oopsy, the hearts were too high to place the tab on the right side). I don't have that background stamp so I went with tone-on-tone embossing. It's my birthday today. My grandma gets me to make all of her relatives' birthday cards, but I couldn't make my own now could I? So my sister was nice enough to take on the task! This is the awesome card she made! Very vibrant, and with my favorite image: Stars! Why was it blah? 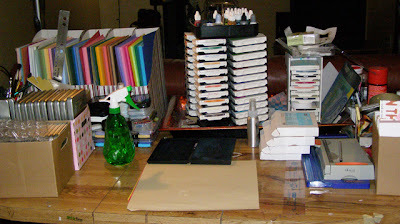 Well, I was in a sad mood today, so I decided that it would be a good time to clean up my craft area. Nothing cheers you up like a nice clean table, right? I have to say, it worked a bit! Here's my table top. I've got a lot of stuff jammed onto my old kitchen table. It ends up leaving about a 15 x 15 space to work with. I'm just happy I managed to fit most of my paper, all my clear stamp sets (and there are LOTS), all my inks and my cutters on there. It's so nice having all the basics within an arm's reach. So once that was done, I had to get to using all that space. I loved yesterday's layout so much I decided to do it again! This one uses Flourishes' Open to Love. I think this is my first paper piecing attempt. If I have ever done this technique, it must have been so traumatic that I blocked it out, lol! So I stamped the vase, then again onto Basic Grey's Blush paper and cut out the vase and the hearts. This was one of those challenges where I saw the colours and thought, "what". But as soon as I pulled the cardstock out I went "OH!". They look fabulous together! I looked through my little black book of sketches and found this one. It's a slight twist on a favorite of mine. I thought these colours seemed pretty masculine so I went with a masculine-ish birthday card using a retired set, All The Best. For the leaves, I inked them up with a wasabi spot, then outlined with a blender pen dipped in Bayou reinker. Then to blend it all together, I gently tapped the spot back over the image once more. Accessories, etc. : blender pen, stitched grosgrain, pop dots. I saw the latest to my local Michael's Studio G stamps and spotted this cute kitty. The card is a pretty basic design. I just felt like making something, and found that the darker grey, coral, and Caribbean looked quite nice together- kind of a retro colour scheme. The cat and letters were coloured in with a blender pen and reinker. The blender pen has a finer point than the aquapainter and it can be made into any colour of ink. I decided to combine two Friday challenges that I spotted. First there was Sharon's: to make a long and low card. I've been on somewhat of a 6x3-1/4 card kick anyway lately, so I was happy to make one more! 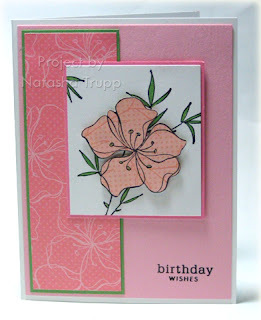 The other challenge was to make a card using... NO WHITE OR VANILLA cardstock. So I was really wanting to use the little cupcake from Holiday Blitz. I decided to use creamy caramel as my neutral. I placed it in a dotted circle, then decorated it. The cupcake was iced with liquid pearls and rose stickles. The candle flame was first coloured in with a white gel pen, then I applied some clear stickles, and then some yellow glitter. 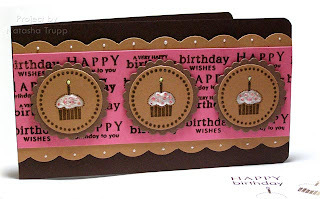 The wordy background was made using the 3 birthday sentiments from Faux Ribbon. I embossed those with chocolate scented embossing powder- Yummy!! I couldn't find my scalloped scissors, so I went with the large (and retired) corner rounder scalloping instead. For those wondering about envelopes for this size card, I use a 3-5/8x6-1/2 or a 7-1/2x4 envelopes. The first size is readily available in boxes of 100 at most dollar stores. The second size is from a card company's overstock. Now that Christmas is over, be prepared for the onslaught of Valentine's Day cards. I've never been keen on sending out valentines, but I do like making them! On a list of basic graphic shapes that I like to stamp, I'd say it goes Stars, Circles, and then Hearts. 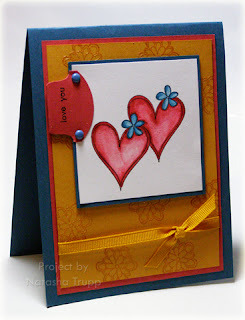 Here's a very elegant heart, by Flourishes LLC. The word love and the quote(my background stamping) are in the same set. 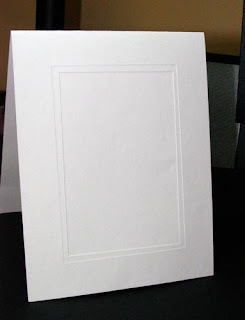 Here's a picture walk-through for using cardstock rectangles to make embossed frames on your cards. 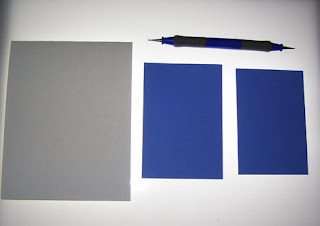 Start off with a light coloured cardstock, a stylus, a light table, and 2 darker coloured paper templates. It's important that these be proportional to each other and to the card front. I used a 2.75x4 template and a 2.5x3.75 template. 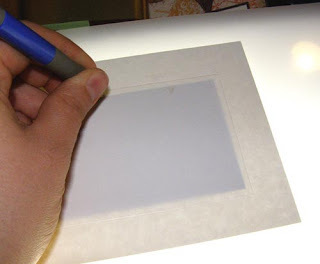 For this step, it's helpful if you have a good eye for centering things. If you don't, perhaps attach the dark template to a very thin piece of copy paper that is the size of your cardfront and measure the center. 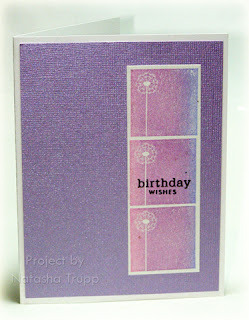 Open up your card, center the card front overtop of the larger template, emboss. Next up, center the smaller template within the part you just embossed. 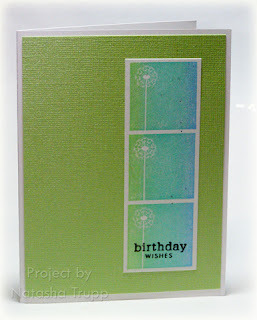 Again place the cardfront OVER the template and emboss. And there you have it, a classy embossed rectangle cardfront. 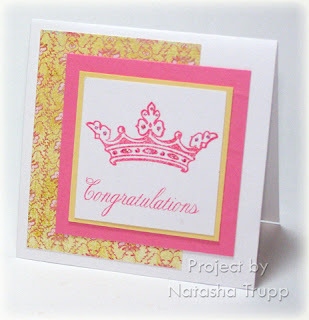 For the card I made yesterday, I stamped first, then did the dry embossing. This made centering the templates even easier. 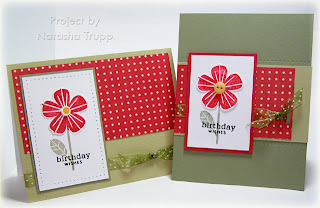 If you want a slightly different look, try flipping the cardfront for the smaller template (i.e. 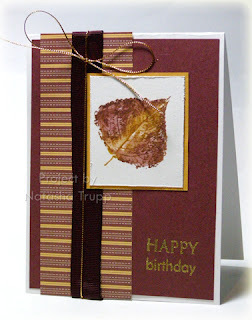 do the dry embossing directly on the outside of the card instead of the inside. You'll get a slightly different look. Thanks for looking. I hope that helps you! Don't be afraid to try different shapes and measurements!